Oh, hello! I almost didn't see you through this mountain of Wilford Brimley's greatest nightmares. It's Christmastime at the McFist household, and once again we have been called upon to bake. To cook. To destroy. And we do all these things for Christmas candies! Here we see the finest of Christmas goodies waiting to be attacked with hands and mouths! 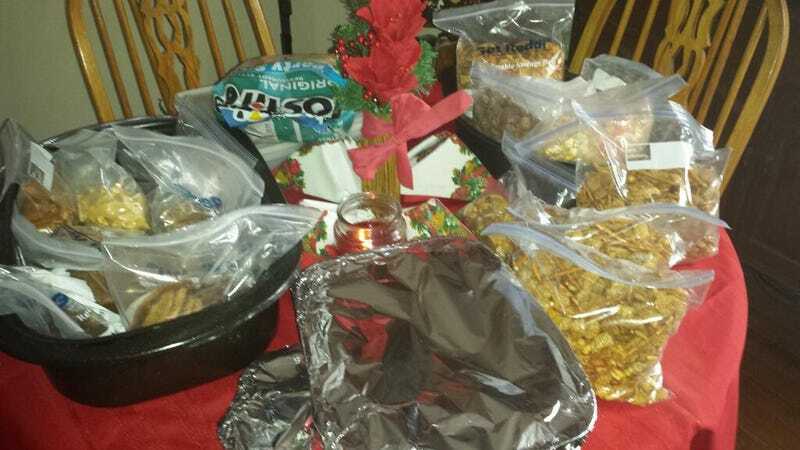 On the right — all the homemade chex mix you can sink your teeth into. Some of it has been coated lightly in caramel, to give the sweetest of flavors to the breaded treasure. There are ample bags in supply, as the Uncle endeavors to annihilate all things scrumptious with his appetite. I did better though. I attacked him for his crab rangoon. Easy choice. In the center, homemade tinfoil! Not the best of eats, but the government can't spy on you if you're filled with the stuff. Also, underneath the foil are cinnamon rolls. Soft. Tender Succulent. Some of them have pecans on them. Those are gross — the opposite of the taste. Finally, on the left portion of the picture is all the wonderful, sugary goodness that defines the holiday season, besides presents, and snow, and Santa ... and trees... lights. Delicious peanut butter cookies, chocolate chip cookies, double chocolate cranberry cookie bites, chocolate chip cookie bites, chocolate covered pretzels, peanut brittle (gross — not the full flavor), and chocolate-covered peanut butter balls. The peanut butter balls are the greatest, and fullest of all flavors. I live for these each and every year. They are synonymous with the holiday season. Also with gluttony. And, the Tostito's bag is just a Tostito's bag of chips. 'Tis the season. I wish you all the merriest, bestest, and bloodiest of Christmases, this year, and I hope you all get everything you could ever hope for this holiday season.